Learn how to use professionals in the most cost-effective manner! 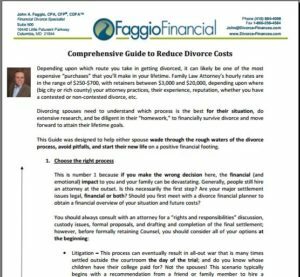 The costs of divorce can literally decimate your finances and dash any hope of your future financial security. The combination of these costs, tax regulations, and large reductions in family propertyvalues are putting additional pressure on an already stressful situation of going through the divorce process. Complete our (very) quick request on the right hand side of this page and you will immediately be able to download our Guide along with our special offer.